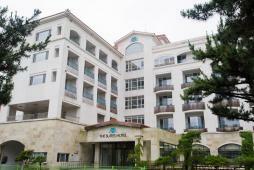 The Suites Hotel Naksan is a four-star hotel within the grounds of Naksan Dorip Park. All guests, with an exception of Deluxe Ondol room guests, look onto Naksan beach, basking in the magnificent sunrise on the Eastern horizon. In close proximity are fantastic tourist attractions including Naksan Temple, Mt. Seorak, Osaek Hot-springs, Unification Observatory, Yongpyeong ski resort, and more. To our guests' delight, the guestrooms are equipped with flat-screen TVs, bidet toilets, and vista balconies. There are numerous amenities such as a business center, restaurant, karaoke room, table tennis facility, and more! The 6th floor sunbeds for tanning in the picturesque surroundings are especially popular among young guests in the summer. Come and create new pleasant memories at our hotel!